Sustanon 250 is an oil-based Testosterone Blend. 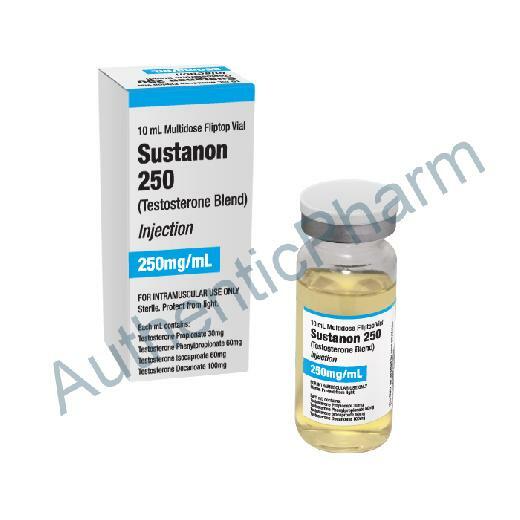 Sustanon 250 is an injectable steroid with four Testosterone esters - propionate (30mg) phenylpropionate (60mg), isocaproate (60mg), and decanoate (100mg). Esters create a depot on the site of administration, and from within the muscles the hormone is released in sustained manner. The role of esters is basically to make the synthetic hormones to resist immediate metabolism. Because of esters, the hormones are released steadily to prevent fluctuation in blood levels. The rate at which the hormones are released depends on the weight and length of the esters; some may take days, while some may take weeks. The longer and the heavier the ester attached, the longer the active life of the steroid. In the case of Sustanon 250, the propionate and the phenylpropionate esters have relatively shorter active lives. Propionate has only one to two days of active life while phenylpropionate has four to five days. Because of these two esters Sustanon 250 provides you immediate kick, so to speak. Isocaproate and decanoate, meanwhile, are longer-acting esters; these two ensure that the Sustanon 250 continues to exert tissue building active for a long time, oftentimes lasting for a month. Isocaproate and decanoate has active life of two and three weeks, respectively. These characteristics guarantee that you're going to get immediate and sustained anabolic activity from Sustanon 250. Also, you won't need to endure frequent and uncomfortable injections since Sustanon 250 stays active in the blood for a long while. The usual administration with this steroid is ever 10 days. Sustanon 250 is effective if administered 250mg per week or 500mg every 10 days. The feedback with this drug is good; many say that with Sustanon 250, you need relatively lower dosage but still get impressive results. With other Testosterone, you have to take higher dosages, and the dosage requirement climbs up as the body becomes tolerant to the drugs. And since Sustanon 250 is effective with conservative dosages, you're less likely to experience side effects. Side effects commonly associated with steroid use are mostly dose dependent. Sustanon 250 has potent androgenic and anabolic effects. Thus, this compound is preferred during mass cycles as it drastically increases muscle mass and strength. Plus, with Sustanon 250 you're getting lesser estrogenic side effects and water retention compared with Testosterone cypionate and Testosterone enanthate. Sustanon 250 is particularly beneficial if you're planning to cut up since it can yield 'cleaner' and qualitative muscle mass. Beginners gain qualitative 20 pounds within a couple of months using 250mg/week of Sustanon 250. If you're taking higher dosages, it is prudent that you use anti-estrogen agents like Nolvadex to mitigate estrogenic side effects. As with other synthetic steroids, Sustanon 250 can also inhibit the natural production of Testosterone, thus a post-cycle therapy consisting of Clomid or HCG is necessary.